BOSTON, September 27, 2011 – Sales of both Massachusetts single-family homes and condominiums rose in August – the first time this year both property types posted an increase during the same month, according to the latest report by The Warren Group, publisher of Banker & Tradesman. A total of 4,203 single-family homes sold in Massachusetts in August, a 15 percent increase from 3,652 sales in August 2010. It represented the second consecutive month of year-over-year sales increases. This is the second time sales have surpassed 4,000 this year. 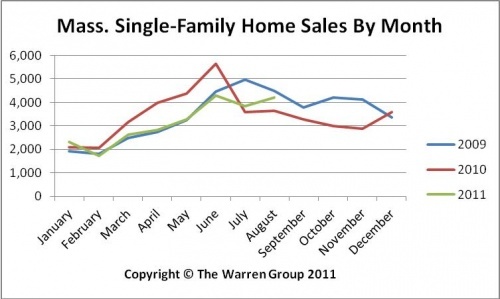 Year-to-date sales remain down 12 percent at 25,101, compared to 28,564 during the same period a year ago. “On the surface, the August numbers appear to be very strong. But we’re comparing sales volume to a month last year when buyers were retreating after the tax credits expired,” said Cory S. Hopkins, managing editor of Banker & Tradesman. Last August, The Warren Group recorded the slowest August in two decades. A total of 3,652 single-family homes were sold – marking the first time sales fell below 4,000 in the month of August since The Warren Group began tracking data in 1987. The median price of single-family homes slid 3.4 percent to $305,700 in August, down from $316,500 a year earlier. This marks the fourth straight month this year that the median price exceeded $300,000. The median price for homes sold January through August was $296,000, down 1.3 percent from $300,000 in the prior year. In August, condominium sales statewide increased 5.8 percent – the first time this year that condo sales rose from a year ago. A total of 1,716 condos sold in August, up from 1,622 a year ago. Year-to-date condo sales are down almost 22 percent, dropping to 10,012 from 12,830 during the same period last year. The median condo price dropped 2 percent in August to $292,500, down from $298,500 a year earlier. The year-to-date median price of condos in the Bay State is $276,625, up almost 4 percent from $266,000 a year ago.